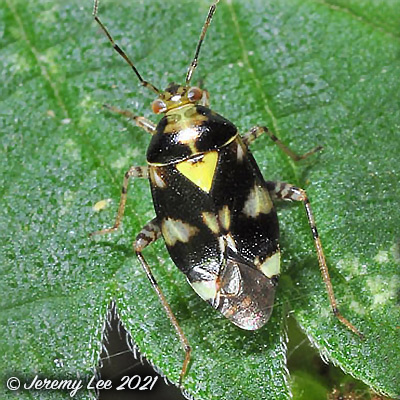 Liocoris tripustulatus, a Mirid Bug, is common throughout the UK and associated mainly with nettles, the foodplant for all life stages, this is a variable but distinctive species. The colour of the scutellum and cuneus ranges from cream to deep yellow and the pale legs are striped with black rings. Short dark spines are present on the tibiae. The head width is equal to 1/2 pronotum width and the length of 2nd antennal segment is greater than the head width. This bug may be found as an adult all year, and variation in colour is strongly related to age. On spring emergence following hibernation, the ground colour is typically darker and the cuneus more orange-yellow. Following mating, females may survive until the new generation of adults appears in mid-summer, which is generally paler and less intensely marked.